To Sum It Up: In the kingdom of Karthia, the ruling nobles have maintained their positions with the help of necromancers who raise them from the dead. The Dead must, however, remain covered by a shroud or else risk becoming lethal monsters known as Shades. Necromancer Odessa’s dedication to her job has been unwavering, until a tragedy shatters her world, and grief envelops her. Meanwhile, Shade attacks are on the rise, and Karthia needs its most skilled necromancer to stop them. Review: As much as I try not to make any assumptions about a book based on the cover alone, sometimes it’s really hard, especially when a cover is particularly eye-catching. 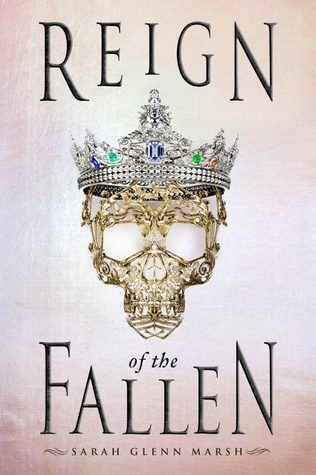 When I first spotted Reign of the Fallen at YALLFest, its cover totally called to me, and after reading the blurb—necromancers, undead creatures called Shades, a kingdom in peril—this book sounded exactly like my thing. Unfortunately, it ended up falling way short of my expectations. This is one of those cases where I should have DNFed but got too far into the book to put it aside. I was also reluctant to DNF this because I had just DNFed another book. I wasn’t too many pages into Reign of the Fallen when I started feeling iffy about it because the book repeatedly mentioned how special the main character, Odessa, was. Odessa’s awesomeness quickly became tiresome. Reign of the Fallen employs a lot of telling vs. showing, and this affects so many aspects of the book, from the world-building to the character development. The world is never really fleshed out, and I couldn’t buy into it. The King of Karthia and his fellow royals have ruled for two hundred years because necromancers have raised them from the dead. Those who have been brought back must, however, remain completely covered by a shroud because if any part of them is seen by a living person, the dead individual turns into a zombie-like Shade. There’s no explanation for why this happens; it just does. The book also doesn’t go into any detail about the necromancers’ magic. For a fantasy read, Reign of the Fallen glosses over its fantasy elements. All of the telling also undermines the emotional punch the novel tries to deliver. Odessa suffers a terrible loss early on, but the depth of her relationship with that character isn’t conveyed effectively. This in turn lessens the emotional impact of a chunk of the book, which follows Odessa’s grief-driven spiral into an addiction to calming potion. Both the book’s title and synopsis focus on the plotline involving an alarming increase in Shade attacks, but it takes a long time for that part of the novel to move to the forefront. Even when the story shifts to the threat posed by the Shades, there’s zero mystery as to who’s behind it. I’d hoped for some kind of twist because the clues were so obvious, but alas, there was none. 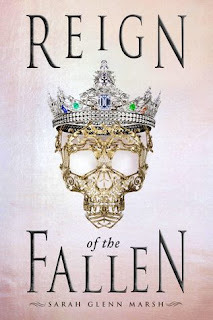 In the end, Reign of the Fallen was not at all the book I’d thought it would be. It barely explored any fantasy, which was disappointing because the premise had so much potential. Instead the story veered down a different path, which would have been fine if the book had dug deeper into the weighty subject matter as opposed to just describing it through telling. I’d hoped to like this as much as Garth Nix’s Sabriel, another fantasy with necromancy in it, but sadly, it wasn’t meant to be. All in All: I should have listened to the part of my brain that said this book was not going to work out and given up after the first few chapters didn’t wow me. Meh, I hate that too, telling than showing especially in fantasy. It makes everything so anti-climactic and hard to get invested or suspend disbelief. Next time, don't hesitate to DNF, life is too short! You are 100% right, sis. I need to stop being so stubborn about DNFing, lol, so I can move on to a book that's more enjoyable.